Dungannon Swifts maintained their unbeaten start to 2019, but boss Kris Lindsay isn’t getting carried away just yet. Four wins and a draw in January have left the Swifts just two points off the Europa League play-off spot. But Lindsay knows there’s a lot of football still to be played. “We’ll just keep trying to keep our momentum going and keep the points ticking over,” he said after the 2-1 win at Coleraine. 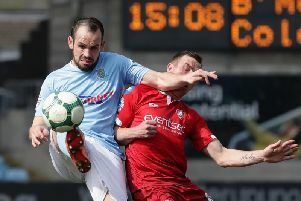 “Yes, we’re looking at the teams above us, and if we continue to win games then you never know, but the gap is quite big between ourselves and Cliftonville in sixth. “All we can do is look after ourselves and try and win games. “We have to be looking to get that European play-off place, but it will be down to the boys continuing on this form. “To a man we worked our socks off against Coleraine, and that’s the bare minimum. “If you get that right then our quality on the break will hurt teams, and that’s the way it has been over the last few weeks. “We’re undefeated through January and now it’s up to us to keep that going. “The mood is high at the minute and it’s about keeping that ticking over. “I’m very pleased with the performance and the victory at The Showgrounds. “I thought we were really, really good today. “The first half was probably even enough, we probably had a few more clear-cut chances, but Coleraine probably had more of the ball than us. “It was disappointing to concede so soon after scoring, but it was probably the one time in the match when Chris Hegarty and David Armstrong made a mistake. “Outside of that they were outstanding. “We regrouped at half-time, the weather didn’t help, we knew it was going to be a battle, but we stood up and were counted. “We hit Coleraine on the break on numerous occasions and Oisin Smyth scored a great goal. “He’s carried on his performance from Ballymena away into last week against Cliftonville and now here at Coleraine. Coleraine boss Rodney McAree agreed with Lindsay’s assessment after the game. “I thought we were beaten by the better side on the day,” he said. “I did not think we performed as well as we can do and I do not think we worked as hard as what we can do. “Is there a slight touch of complacency in it? I don’t know. “I think that is maybe being a little bit respectful to Dungannon Swifts because I think they done really well and caused us problems. “Runners from deep caused us problems and Paul McElroy dropping back off the front man caused us problems. “We made the pitch too big for ourselves when we did not have the ball which made it easier for Dungannon to play through us. “There is quite a bit that we can go away and think about, we will obviously go away and watch the game back. “We will try and see what we do a little bit better and we can can obviously do a little bit more in the final third. “I thought Daniel Hughes and McElroy were outstanding for Dungannon and the two of them caused us problems all day. “I felt late on we did not create enough opportunites or put Dungannon under any real pressure. “There are a lot of things but we tried to say as little as possible in the dressing room because sometimes you can speak and it can be a little bit hasty.